Don’t be fooled—mini golf in Tennessee isn’t always the walk in the park you think it should be. Here you’ll find some exceptional mini golf courses that can challenge even the savviest of golfers, and where the ball will end up is anyone’s guess. 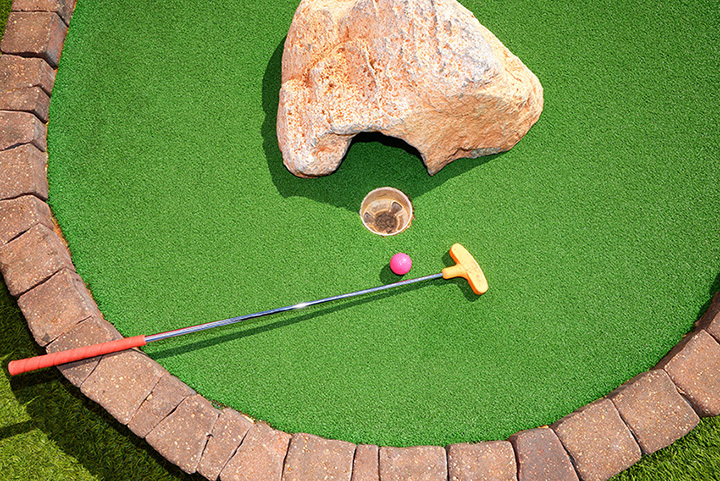 For an experience that’s equal parts satisfying, brag-worthy, frustrating, and endlessly fun, you’ll want to try your luck at these 10 best mini golf courses in Tennessee. This candy-themed adventure gives you two ways to play: inside in a sweet, sweet wonderland or outside with multiple levels of fun, flavor, and challenges. Every hole is an adventure, with vibrant colors and scenery to delight kids and adults of every age. Inside you’ll also find a sprawling candy store, ice cream counter, and all the chocolates and treats you could want to reward yourself for a game well played. This old-but-gold golf course has been around for ages and remains one of the most unique courses you’ll ever play. Situated against the mountain, players take a short tram ride to the top and play their way down while enjoying some amazing views of the city. They’re open seasonally starting the spring and close for the winter. Playing mini golf in the dark brings a whole new challenge to the game. This psychedelic course features bright, glowing scenery at every angle that makes the course come alive. They also have an arcade and laser maze on sight, as well as glow-in-the-dark pottery painting. Fifty-four holes, three courses—one location. This farm-themed golf adventure is masterfully crafted to provide fun, challenges, and oddities on every hole. Families love coming here because of the kid-friendly vibe and the well-maintained courses. Make a hole in one on your final shot and you get a free game! The ropes course is usually the main attraction here, but the mini golf course isn’t to be missed. Played just underneath the sky-high obstacles, players can explore the musical instrument-shaped greens for a mini golf experience you won’t find just anywhere. This course is one you’ll want to play more than once. The whimsical, offbeat decor on this course makes it one you’ll want to experience at least once. From dinosaurs to ships to safari animals and more, this kitschy little course is the ideal balance of odd, curious, and fun. While you’re there, you can also get dirty in a game of paintball, zip around in a go kart, or cool off on the inflatable water slides. Home of a top notch scuba and snorkel training facility lies one of the best mini golf courses you’ll ever play. Reasonably priced at just $5 for 18 holes, the course integrates natural elements like ponds and stone to create an authentic look and feel. Kids love seeing the giant animal replicas throughout the course that look right at home at this ocean-themed adventure. With three courses and 54 holes to choose from, this safari-themed mini golf course surprises and delights. The holes look simple enough, but they each hold their own set of challenges that will keep even seasoned mini golfers on their toes. The mini golf courses are part of over 40 acres of attractions, including bumper boats, ropes course, laser tag, arcade, VR coaster, kiddie rides, and more. This mega complex has golf attractions to suit every skill level, from a driving range to two mini golf courses. The courses are simple and straightforward, but they’re not without their challenges. There’s not much shade along the way, so playing in the evening or in cooler weather is usually ideal. Part of a complete family fun center, this mini golf course is full of family friendly fun. A tropical theme is complete with plenty of greenery, waterfalls, and bridges that are clean and well taken care of. An arcade, go karts, laser tag, and cafe mean you can spend the whole day here.